Physical activity is a basic component of geriatric prevention. Lower physical activity of seniors is a cause and effect of many chronic conditions, e.g. type 2 diabetes, obesity, diseases of musculoskeletal system or cancer. This paper analyzes Polish and international literature in terms of significance of physical activity for keeping and improving health of seniors. Numerous studies carried out at large research facilities all over the world proved that taking up physical activity by seniors is one of the key factors for ensuring better health. It is, however, important to precede workout with medical examination. After that, suitable exercises, their frequency, duration and intensity need to be determined. The conclusion of this paper is as follows: regular physical activity improves effectiveness of preventive measures and treatments related to diseases such as cardiovascular disease; it also reduces mortality rate and prolongs the period of physical and mental activity of seniors. 1. Aria A., Ishida K., Tomimori M., Katsumata Y., Grave J., Tamashiro H. Association between lifestyle activity and depressed mood among home-dwelling older people: a community-based study in Japan. Aging&Mental Health. 2007; 11: 547–555. 2. Blair S.N., Kohl H.W.I., Barlow C.E.. Paffenbarger R.S. Jr., Gibbons L.W., Macera C.A. Changes in physical fitness and all-cause mortality: a prospective study of healthy and unhealthy men. JAMA. 1995; 273: 1093–1098. 3. Borowiak E., Kostka T. Predictors of quality of life in older people living at home and in institutions. Aging Clin. Exp. Res. 2004; 16: 212–220. 4. Chipperfieid J.G. Everyday physical activity as a predictor of late-life mortality. The Gerantologist. 2008; 48: 349–357. 5. Corner L., Brittain K., Bond J. Social aspects of ageing. Psychiatry 2004; 3: 5–7. 8. Gębska-Kuczerowska A. Ocena zależności miedzy aktywnością a stanem zdrowia ludzi w wieku podeszłym. Przegl. Epidemiol. 2002; 56: 471–477. 9. Kaczmarczyk M., Trafiałek E. Aktywizacja osób w starszym wieku jako szansa na pomyślne starzenie. Gerontologia Polska. 2007; 15: 116–118. 10. Kliginan E.W. Recommending exercise to healthy older adults: The Physician and Sports Medicine. 15, 1999. 11. Knoops K.T.B., de Groot L.G.M., Kromhout D., Perrin A. Mediterranean Diet, Lifestyle Factors, and 10-Year Mortality in Elderly European Men and Women: The HALE Project. JAMA. 2004; 292: 1433–1439. 12. Kostka T., Bogus K. Independent contribution of overweight/obesity and physical inactivity to lower health-related quality of life in community-dwelling older subjects. Z. Gerontol. Geriatr. 2007; 40: 43–51. 13. 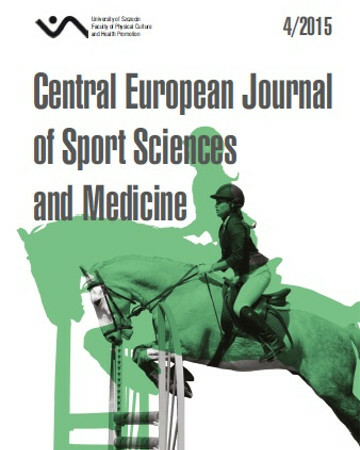 Kostka T., Drygas W., Jegier A., Zaniewicz D. Aerobic and anaerobic power in relation to age and physical activity in men. Int. J. Sports Med. 2009; 30: 225–230. 14. Kostka T., Lacour J.-R., Bonnefoy M. Response of blood lipids to physical exercise in elderly subjects. Prev. Cardiol. 2001; 4: 122–125, 131. 15. Lampinen P., Heikkinen R., Kauppinen M., Heikkinen E. Activity as a predictor of mental well-being among older adults. Aging&Mental Health. 2006; 10: 454–466. 16. Onder G., Penninx B.W., Balkrishnan R. Relation between use of angiotensin-converting enzyme inhibitors and muscle strength and physical function in older women: an observational study. Lancet. 2002; 359 (9310): 926–930. 17. Petrella R.J. Exercise for older patients with chronic disease: The Physician and Sports Medicine. 11, 1999. 21. Sumic A., Michael U., Carlson N., Howieson D., Kaye J. Physical activity and the risk of dementia in oldest old. J. Aging health. 2007; 19: 242–258. 22. Sumukadas D., Witham M.D., Struthers A.D., McMurdo M.E. Effect of perindopril on physical function in elderly people with functional impairment: a randomized controlled trial. CMAJ. 2007; 177: 867–874. 23. Sygit K. Problemy zdrowotne i społeczne seniorów (studium socjomedyczne). Uniwersytet Szczeciński 2008. 24. Tinetti M.E: Performance-oriented assessment of mobility problems in elderly. J. Am. Geriatr. Soc. 1986.